Charge #17 has been mailed! The 17th issue of the hard copy Charge! newsletter / magazine has been printed, collated, and stuffed into mailing envelopes. More newsletters are being printed for late membership renewals. This issue features Chris Maes’ new bolt-on rules for adding riverine and coastal naval actions to the existing Johnny Reb 3 rules. Entitled “Jack Tar,” these are sure to be popular and will elicit response from the gaming community. Also included in this issue is a scenario Chris wrote for a combined arms attack on Fort Fisher in North Carolina, which can be used to try out these rules. The scenario has infantry (standard JR3 rules), naval guns, Navy landing parties, transport boats, and othr goodies! Also in this issue is a scenario written by Jon Coulter of Old Dominion Game Works for the Battle of Belmont. While specifically written with his American BattleLines rules in mind, it is readily adaptable for JR3, Regimental Fire & Fury, etc. Also included is Brian Scherzer’s classic overview of Civil War carbines, a very important weapon for the cavalry of both sides. If you have never read Charge!, sample issues are available for $5, plus $2 postage and handling. Contact the Johnny Reb Gaming Society for details. Your favorite ACW figure manufacturer? 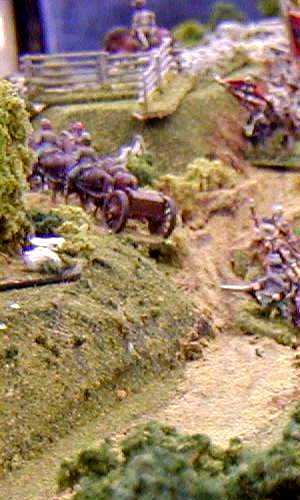 I have more than a thousand 15mm ACW lead-pewter miniature figures in my wargaming collection, which is a broad array of various makers and types. The majority of my armies are from Old Glory and Musket Miniatures, with a decent scattering of AB / Battle Honors and older Stone Mountain figures. However, I have Peter Pig figures, Naismith Design, Falcon, RAFM/ FreiKorps, GFI / Minifigs, and a host of others, including some vintage Confederettes from Heritage. What is your all-time favorite manufacturer of ACW wargaming figures? What scale? Why is that your favorite? 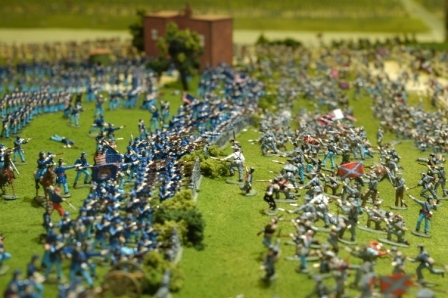 Civil War toys remain fascinating to me, perhaps because I have so many fond childhood memories with my motley collection of soldiers, cannons, and accessories, which formed the genesis of my hobby of miniature wargaming. I used to set up elaborate battlefields in my Dad’s apple orchard, with defensive lines snaking into the garden. I would pile up rocks for Devil’s Den, and create earthworks and breastworks, using piled up sticks. Battles would be fought by tossing marbles until one side was decimated. Most of my ourdoors battles were in 54mm, but during the winter or during rainstorms, I often moved my battles indoors with my HO scale Airfix figures. I had 4 or 5 boxes of them, acquired as birthday gifts or as rewards for good grades. I had infantry, cavalry, and artillery. Although the layouts were far less elaborate and I had far less figures in this scale, the fighting was just as ferocious. The targets were smaller and harder to hit. My Mom kept a very large planter on the living room coffee table for many years, and it made a wonderul place to set up the tiny Airfix ACW figures, augmented by Giant figures (HO scale versions of the 54mm Marx poses). Perhaps the array of green plants made it seem more like Guadalacanal than Gettysburg, but an eight-year-old didn’t care. It was war, and I was the commander. Anyone else play army? What are some of your memories of battles of long ago? HUGE 25mm ACW collection for sale!!! “I have too much stuff and not enough time or room for my 25mm collection. I need to focus on my new project, which is Gettysburg in 10mm. So, I am selling everything I have related to 25mm ACW. I have over 1,500 painted figures, which includes infantry, artillery, cavalry, zouaves, Berdan sharpshooters, officers, drummers, flagbearers, dead and wounded. I also have a scratch-built house with removable roofs, fences, stonewalls and other numerous terrain accessories. Everything is high quality painting. I will sell individual squads and pieces or the whole collection at a large discount. I am currently doing a total inventory. Please email me for information or pictures. Let anyone know that you think may be interested. I might add that I have seen parts of John’s collection when we have gamed together in Gettysburg at Patriot’s Point. I can vouch that his figures and accessories are excellent – well worth having if you collect 25mm ACW figures for wargaming or dioramas. The custom-built house is fantastic! Contact John and have a look at some of these figures on his website! UPDATE: 10/26/07 The entire collection has been SOLD. Thanks for your inquiries. The National Park Service has announced that it has commissioned a new trolley system to connect its new Visitors Center (which is slated for a grand opening in April if it continues to be on schedule) with downtown Gettysburg and other key stops. The new system will be up and running by next spring. The Park Service is still deciding if it will physically operate the trolleys under direct NPS control (a la their bus service to Ike’s farm) or by private contractors operating under a license from the Park Service). The proposed trolley line would make a total of nine stops, including the downtown square, a pair of stops along the tourist/hotel region on Steinwehr Avenue, the National Cemtery, the VC of course, and a couple of others. The fee for the trolley ride has yet to be determined, but leading hotels will be allowed to purchase trolley passes for their guests. The project is receiving widespread backing from the tourism and visitors folks, as well as from private businesses that had been very concerned about the NPS decision to move their VC away from tourist row. 1. The NPS will continue the tree cutting project over the winter, with clearing set for several new locations. 2. Reynolds Avenue will be closed to the public for three months over the winter, starting in January. The bridge over the famed Railroad Cut will be replaced during this downtime. 3. The Cyclorama restoration is on schedule. Half of the 14 individual panels have been hung on their new mountings in the new VC. The local newspaper had photographs a couple of weeks ago. The Cyclorama will be higher than before, as sections cut off years ago are being replaced with modern replicas that will allow the viewer to see much more sky. 4. The current NPS-approved audio tape tour is being expanded to cover a “fourth day,” with new stops downtown and a longer tape that explains more of the post-battle impact on Gettysburg. It will include a stop at the restored Wills House, where Lincoln stayed during his November 1863 visit to Gettysburg for the cemetery dedication. 5. The NPS will unveil a brand new, totally redesigned Gettysbburg National Military Park website by the end of this year, with dozens of new and improved features. The magnitude of what the NPS is trying to accomplish is staggering. The good news is that more than $1 million of unplanned money is being diverted by the Federal government to Gettysburg. It is money earmarked for other parks (such as Valley Forge), but they do not have approved spending plans in place, so the NPS is shifting cash to Gettysburg, which has a number of plans in the hopper that can use these funds. In rummaging through the vast number of toy soldiers (in a box that I had not looked at for years, mostly cowboys / indians and Civil War, but with a large contingent of WWII as well), I noted a lot of older figures that I had totally forgotten about. Anyone remember the MPC “ring hand” figures? Pretty generic poses, and fairly low price. Not nearly as detailed as their regular line of figures. Blue and gray guys for the Civil War; brown for cowboys, gray, tan and green for WWII and Vietnam, etc. Each hand was a “ring” or circle, which enabled the toy figure to “hold” weapons. The Civil War guys came with pistols, rifles, or swords, some of which I still have. Sword belts, hats, and pistol belts made up the rest of the accessories for the MPC line. They are also noted for the round hole in their base, which enabled them to “stand” on pegs on certain MPC vehicles. Unlike some other figures from the early 1960s, the MPC figures are still relatively flexible and in great shape (some of my Marx figures, particularly the WWII Japanese, are brittle as the plasticizer has long since evaporated or otherwise became ineffective). In future installments in this blog, I will cover some other vintage figures that could be used for Toy Soldiers wargaming rules. Anyone remember playing with MPC figures as a kid? Recently, I was rummaging around in our crowded basement storage room and opened a large bin chockful of old toy army men. Many of the plastic warriors were from when my kids were small in the 1980s, but a significant number were from my childhood in the 1960s. As I examined the thousand-plus figures, there was a dazzling array of types and manufacturers. Here was the majority of my old Marx 54mm Centennial edition “Blue & Gray” playset. Scattered among the more recent figures were vintage Britains, Swoppets, Timpo, Timmee, MPC, Lido, and other makes I have long since forgotten. Cannons, fences, horses, wagons, trees, lunettes, you name it, it was in the box. The 60’s were truly a hey-day of plastic playsets. I had the Marx Civil War set, as well as the ever popular Fort Apache, with its baffling, but colorful array of green, blue, yellow, and even red Indians. I also had the smaller Boonesborough set with its 54mm Daniel Boone (which came about from the Fess Parker TV series of the time). I had a few bags of Marx WWII figures (Japanese, Russian, German, US soldiers), and many others. When I got money for my birthdays, I would make sure I headed to S. S. Kresge’s the next time my parents went to town. I still have my Marx “Warriors of the World” figures, complete with their descriptive trading card and their mint boxes, still stamped with the red circle with the number 10. A dime a figure seems like a bargain today, but then, it was a steep price when you only had a quarter to spend. In my quiet little neighborhood, a number of the mothers gave me their older kids’ collections when they outgrew them, so my armies grew as the wars escalated in the sandbox under one of Dad’s many apple trees in the back yard orchard. My little grandson just turned two. I bought him one of those cheap plastic sets of Civil War soldiers that Americana Distributing seems to sell at every Gettysburg tourist trap. That way, he has his own ACW playset until he’s old enough to layout the vintage Marx figures for a grand battle tossing marbles at the figures until the last man is standing. Another generation, another chance to teach a love for history through plastic army men! Anyone else have memories of your playsets or toy soldiers when you were a kid? Do you still have any of them? What’s your favorite set? How did you play sham battles with them? Marbles? Stones? Something else? I have for thre months been keeping a blog of local (York County, PA) Civil War events, history, and biographies. I would welcome CHARGE! readers to also check out Cannonball, and feel free to post your comments and thoughts! The new blog has fast become a key part of the York Daily Record‘s overall group of history blogs. Gettysburg remains one of the most studied battles in American history, with over 1,000 books written over the past century discussing nearly every aspect of the conflict. With the vast array of titles and subjects, it is tempting to think that every angle has already been covered ad naseum. However, author Phil Cole, in his Command and Communication Frictions in the Gettysburg Campaign, has written a dandy little treatise covering the communications and leadership issues and challenges that the commanding officers and their leading subordinates faced during the Gettysburg Campaign. It is a topic that has been addressed at times in various places, but not in a single volume that focuses on the communications problems that plagued both armies.